Product prices and availability are accurate as of 2019-04-20 21:29:31 UTC and are subject to change. Any price and availability information displayed on http://www.amazon.com/ at the time of purchase will apply to the purchase of this product. 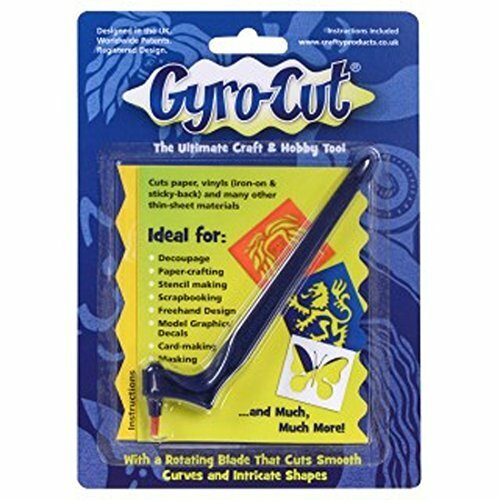 The amazing GYRO-CUT craft and hobby tool easily cuts through paper, card stock, adhesive-backed vinyl and 4 mil plastic sheets. Perfect for all types of paper craft and stencil making projects including decoupage, card making, scrap booking, and pattern making. This ergonomically designed hand-tool has a 360 degree rotating head which enables anyone to cut complex shapes easily and quickly. Unlike scalpel style knives the GYRO-CUT blade will not easily cut the skin in normal use.